We have never been there. They sent us information very quickly – we like responsiveness! We know images can be enhanced, but the stunning views of mountains and lakes were irresistible. After living in the Arizona desert, an abundance of lakes, waterfalls and rivers will be a welcome change. The scenic byways sound entrancing and the diversity of climates is always a great idea if you want to see a lot in very little time. My husband wants to get some golfing in. Idaho has an abundance of that. Towns with names like “Bliss,” “Eden” and “Cascade” are so evocative we can’t resist. We once met a Coeur d’Alene resident who couldn’t say enough great things about the city. We want to see Coeur d’Alene – scenery, culture and golf – sounds almost too good to be true! More to come as we refine our travel adventure! NO, we’re not robbing a bank! When it gets to this time of year in Phoenix, people start leaving. The weather begins to be warmer and the snowbirds start flocking up north. We have thoughts of migrating ourselves. We have a short trip to LA coming up, but we’re also planning a longer stay. We had several ideas. First, we’ll stay stateside since we’re not in the mood for customs and dealing with currency conversions. Also, we don’t want an enormous plane ride. We’re open to the possibility of a drive, but we don’t want to spend most of the vacation getting there. I voted for open spaces, but I need to see water. My husband also likes open spaces, but he likes mountains. California? Been there, done a lot of it. Colorado? Maybe. I keep hearing about Durango and picturesque mountains. Wyoming? Certainly, it has the open spaces! Idaho? The scenery looks great in the brochures! Washington (the state)? We drove through on our way to Vancouver. I’d get my water and my husband his mountains. We’ve sent for new brochures. Yes, I know, the mountains and natural features don’t change too much in a few years. But, hotels and manmade items do change. With visions of exploration and open vistas dancing in my head, I will sign off for now. Come back next week, and we’ll share more about our plans. Out west for sure! 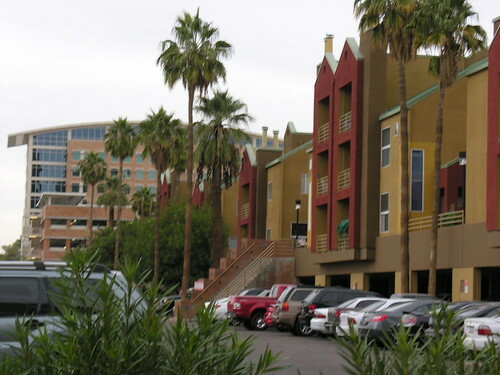 Tempe, the hometown for Arizona State University, is a vibrant city with business, social and quality of life issues well-handled. With a population of 175,000-plus residents, Tempe has a business center, new malls, revitalized housing stock and is just a fun place to be. It’s also near to Phoenix Sky Harbor Airport, so there is easy access in and out. 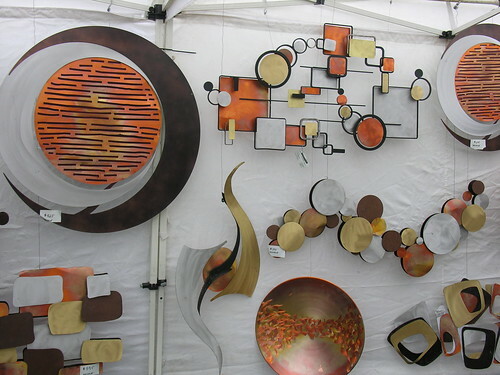 During the weekend of December 4-6, Tempe hosted the Festival of the Arts, an arts and crafts gathering that last year attracted 250,000. 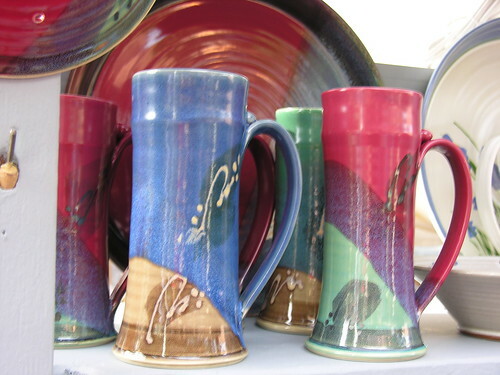 In 2009, over 400 artisans with some stunning work were displaying and selling their works. Pottery, glass, wood, photography, woven items, painting, sculpture and even food showed the individuality and quality of the handmade efforts. With no two works identical, visitors had the opportunity to see and buy something for their use for as little as $5 or as much as thousands. Bands also performed throughout the Festival. On the jazz stage, we heard the Chandler-Gilbert Community College Band perform big band numbers. They had an interesting medley with “Auld Lang Syne” intermingled with Christmas carols, plus a rendition of “On the Street Where You Live” from My Fair Lady. To host the Festival, Tempe blocked off about fifteen blocks of the downtown area. Since these events occur regularly in Tempe, check out the light rail which travels right through the campus to save you time looking for a parking spot or $10 for event parking. The light rail is relatively new to the Phoenix area, but it is clean, on schedule and reasonable in cost. It may be in the desert, but Tempe has an amazing amount of water. Tempe Town Lake, a manmade body of water, is a centerpiece for many community events. In the area adjacent to the lake, events from ethnic fairs to fireworks are held regularly. If you’re coming to the Phoenix area for a visit, we recommend that you check out what might be happening in Tempe. There are hotels in Tempe if you care to stay; the aloft hotel is new, a “hip” hotel, and there are other hotels that can put you right in the middle of things or give you some quiet at the end of the day, if you prefer. You can’t miss ASU’s presence in Tempe; it is unmistakable. Come back tomorrow for info on Arizona State University and other amenities in the area. 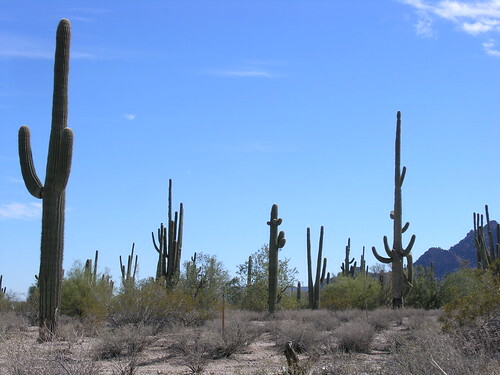 The first time I came to Arizona, it was a major revelation for me. The sunny, blue skies were so welcoming – even at the 100-plus degree temperatures in the middle of summer. I got off the plane and, when it was time to go back, I really didn’t want to! This is the day in the United States that families give thanks. But, it has grown far beyond what the original Pilgrims could ever have envisioned. We have a humongous feast that can take days to prepare. We truly do have much for which to be thankful. Years ago, I traveled to Plymouth Rock where the Pilgrims landed and it had become extremely commercialized. There were little stands with the usual gimcracks and souvenirs. Buying things seems to be what everyone thinks about when they consider traveling. And, I admit, I have purchased my share of souvenirs, too. Somehow, the anticipation of seeing a new place and the sense of wonder and discovery has now been dulled by security checks and the many rules and regulations that now govern our travel. In this blog, we have tried to feature places where we have enjoyed the travel, the people and the indelible scenes that have enriched our lives. The reason I decided to publish a travel blog was that the newspaper for which I write, a small city’s paper, had asked me to cover travel. They decided they only wanted to feature local places, which left a whole world of great destinations I wasn’t able to share. So, that led to the beginning of this travel blog. The blog is now eight months old – almost old enough to have given birth to a real human baby. Have we done a good job? Does anyone want to share his/her experiences? Would anyone like to offer comments other than the spammers who perpetually leave messages – or in Russian, which I cannot read? So, I am asking for people to respond and participate. Should we continue the blog? Will you help us by supporting the blog through response and checking out our store? We’re open to new experiences and new people. We’re always thankful for them. And, have a wonderful holiday season to those who celebrate holidays in the next month. To those who don’t have holidays, please accept our understanding that people have different cultures and ways of experiencing the world. We would love to hear from you, as well! May you have health, love and joy in your life and a chance to travel to the places that enlighten, enliven and excite you! PS The new photos at the top of the blog give you some new places to view. Oregon and Las Vegas are featured – two great destinations! GET OUT OF THE …. WAY! It’s time to hop a golf cart over to the birthplace of golf over 600 years ago, St. Andrews.